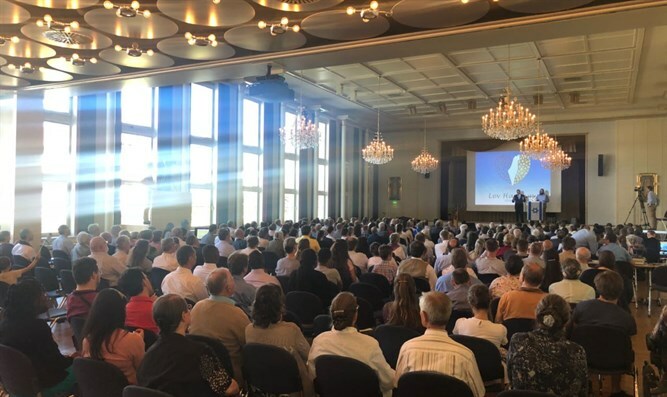 Hundreds of participants attended conferences of support for Israel and communities in Judea and Samaria held in Germany, in the cities of Schaumburg, Krefeld, Reichenbach and others. Responsible for organizing the conferences is the "Lev Haolam" organization which fights the global boycott and the BDS movement and sends thousands of parcels of goods from Judea and Samaria to citizens all over the world every month. The organization holds lectures in many countries around the world, as well as tours of Judea and Samaria for groups of visitors from abroad. The first conference in Germany, which was held in the city of Schaumburg, was attended by about 500 people and was secured by police for fear of harm by anti-Israel activists. The conference featured food products from Israel, and many products from businesses and manufacturers in Judea and Samaria were presented for sale. Attorney Nati Rom, founder of Lev Haolam, spoke to participants about the war against boycott, the history of the Land of Israel and the reality on the ground today, as well as about the funds transferred by the German government from the tax revenues of its citizens to the Palestinian Authority - which transfers them as salaries to terrorists sitting in Israeli prison. The audience expressed great interest in all that was said and many questions were asked during the lecture. "We have already moved through four different cities, a few hours away from each other. The conferences were simply filled with participants. The interest in what is happening in Judea and Samaria and the desire for support is increasing," Rom said. "In these conferences they first receive the simple truths of reality on the ground, and this quickly dissolves all the false walls of BDS. Demand for products from Judea and Samaria is also rising, and this plays a significant part in the economic growth of many businesses in Judea and Samaria. "